There are two things in life that I am particularly passionate about, one is having open, honest and truthful conversations about Mental Health and the other is crafting and creating. I have made it my mission in life to speak about mental health wherever I can and to whoever I can but since having children I have realised that the REALLY important thing is to be talking to them about mental health. I firmly believe that if we start speaking about their mental health and well being with our children from an early age that this ‘normalizing’ of the discussion can help to combat the stigma that continues in society as well as equipping children with the language and understanding to make sense of their thoughts and feelings as they grow. I am by no mean an artistic genius but what I lack in talent I try to make up for in enthusiasm and so I will try and turn my hand to most crafts with differing levels of success. One of the best things that I have found about my children growing a little older now, at 2 and 5, they love having a bash at crafts too. What better way is there to engage children in discussion about their health and well being than through play. 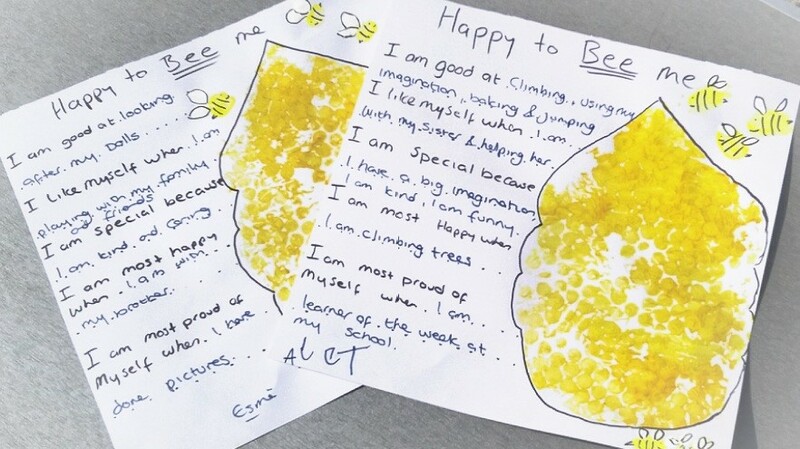 This simple ‘Happy to Bee Me’ activity can help you to start the discussion in your house. Step 1 – Cut your bubble wrap into a beehive shape with your scissors, you can do this like ours, which looked like a hanging hive or you can do it in a pyramid shape but with rounded edges instead of sharp ones. Step 2 – Use your orange/dark yellow paint to paint your bubble wrap on one side. Once it is covered in a layer of paint, carefully lay the painted side down onto your paper. Make sure you lay it to one side of your paper to leave room for you to do some writing next to your hive. 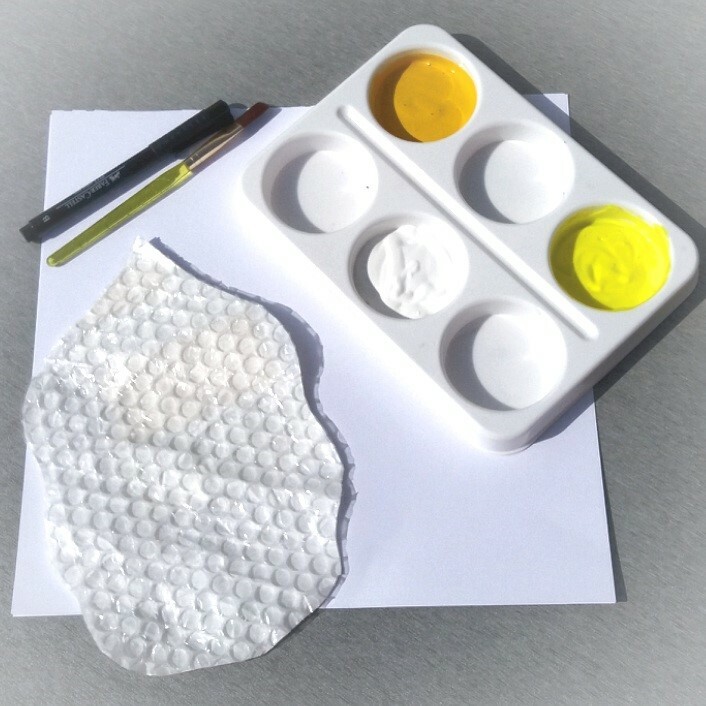 Step 3 – using your yellow paint, make thumbprints around the beehive, you can make as many or as few as you like, these will be your bees, remember to leave one side of your paper mostly blank for the writing later. 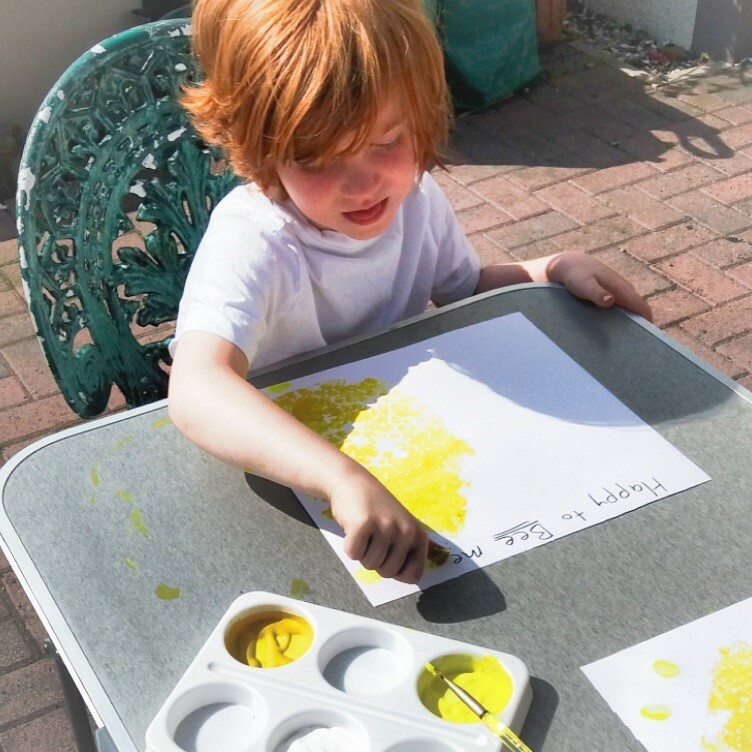 Step 4 – using your white paint, use your finger tips to make small white dots at the top of each yellow thumbprint to make your bee’s wings. Now set this aside to dry. Step 6 – Use your pen again to make your bee’s black strips and little faces. You can also use your pen to draw around the wings to make them stand out more if you want to. Step 7 – Now comes the mental health part. Using your pen write the beginning of some positive affirmations on the side of your paper that you have been keeping clear. Your sentences are designed to make your children think about things that they like about themselves and things that make them happy. I am most happy when………………. I am proud of myself when………………….. The number of affirmations will be dependent on the age of your child, these were simple enough that my 5 year old could answer them but he did not want to write it himself as an older child might. Not to be left out his 2 year old sister joined in and so we helped her answer her questions by making suggestions to her and she chose the answer that was written down. We stuck our finished pictures up on their bedroom walls and continued talking about what makes us happy, this opened up conversation about how we can make others happy, things that make us sad and things that are hard for us to do, which in turn lead to us talking about trying our best and being proud of what we can achieve and having realistic expectations because everyone is different. Not bad really for a project that took less than half an hour to do! I am a mother of two and the creator of Mothering, Mental Health & Me. 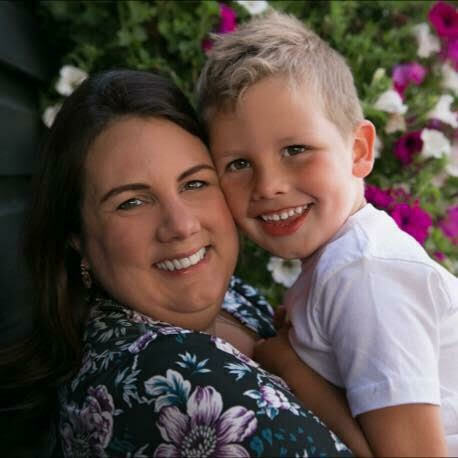 I aim to make maternal mental health more visible by sharing my own experience. I want to encourage open and honest discussion about mental health to create a better world for our children to live in. You can read more from Heather on her Facebook page or by following her on Instagram @motheringmentalhealthandme.